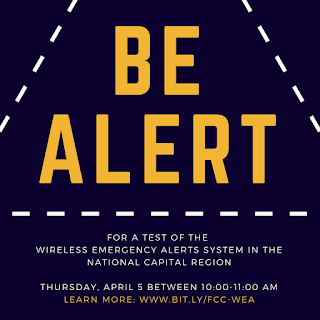 What: Twenty jurisdictions, including Prince George’s County, will simultaneously issue a test message to the public through the Wireless Emergency Alerts (WEA) system. WEA is a public safety alerting system allowing government officials to target emergency information to a specific geographic area using an individual’s cell phone or other mobile device. WEA allows the messaging to be more targeted and efficient which is critical during an emergency. Individuals in the participating jurisdictions will receive the following message: “A test of the Prince George’s County Emergency Alert System. No action required.” The alert triggers a loud noise while displaying the text message on cell phones and mobile devices. Individuals do not sign up to receive a WEA alert. Who: City of Alexandria, City of Bowie, City of College Park, City of Fairfax, City of Falls Church, City of Gaithersburg, City of Greenbelt, City of Takoma Park, City of Manassas, City of Manassas Park, City of Rockville, District of Columbia, Arlington County, Charles County, Fairfax County, Frederick County, Loudoun County, Montgomery County, Prince George's County and Prince William County. People in these jurisdictions during the WEA test will receive an alert on their cell phone or other mobile device(s). When: Thursday, April 5, 2018, between 10-11 a.m. 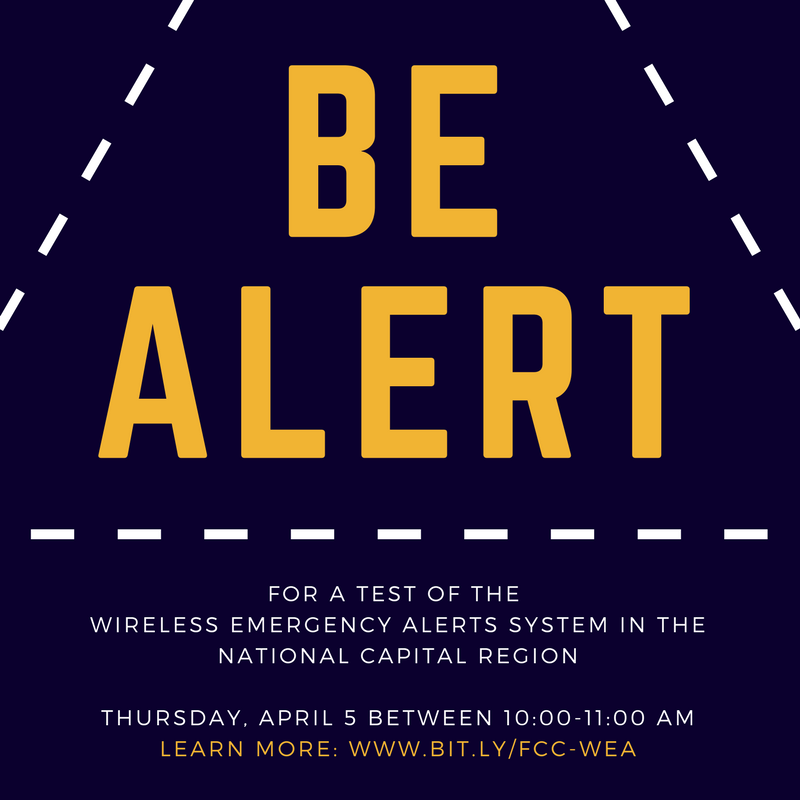 If a real-world event impacts the WEA test on Thursday, April 5, the back-up test date is Monday, April 9, between 10-11 a.m.
Where: Each jurisdiction participating in the exercise will draw a geo-targeted map in their WEA system. Cell phones or mobile devices located outside, but near, the participating jurisdictions may receive the WEA test because this technology uses carrier towers. Why: Periodic testing of public alerts and warning systems helps local governments assess the system and identify any needed improvements. Public safety officials need to be sure that in times of an emergency or disaster, they have reliable methods and systems that will deliver urgent alerts and warnings to the public. Conducting a regional test supports the continued use, training, and improvement of the WEA system.